The Lafayette Township Fire Department has been selected as one of the 2018 Healthier Community Initiative Mini-grant recipients from the Floyd Memorial Foundation.The grant awarded one-thousand dollars for the newly established child safety seat inspection program by the fire department. The grant will assist in funding the program to provide car and booster seats for those in need and maintain training for the certified child passenger safety program. The fire department thanks the foundation for awarding this grant enabling it to give back to our community and help make children safer when they ride in vehicles. Those interested in having their child’s vehicle safety seat and/or booster seats installation inspected should contact the Lafayette Township Fire Protection District for an appointment by calling at 812-923-8003 or by email info@ltvfd.org. 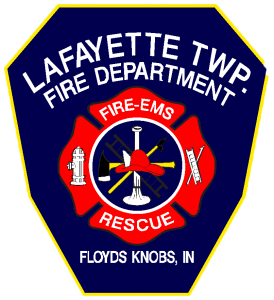 The Lafayette Township Fire Department has been selected as one of the 2018 Healthier Community Initiative Mini-grant recipients from the Floyd Memorial Foundation. The committee reviewed and approved our request for funding of our newly established car seat safety program in the amount of $1,000 which is the maximum amount that is allowed by the mini-grant guidelines. We recently had several members become certified car seat technicians. Our program was created due to an increase of requests for child safety seat inspections by members of the community. The certified technicians completed over 32 hours of training.Healthier Communities Initiative was founded in 1999 by members of the Floyd Memorial Foundation to ensure proper educational, informational and essential resources were in place to meet vital health risk factors of the community. Coalitions are formed based on the community health issues identified in the health needs assessment, conducted every 3-4 years, and are comprised of hospital staff members from Baptist Health Floyd, community health agency representatives and volunteers. Current Coalitions include Physical Activity, Nutrition and Tobacco Cessation and Prevention. On behalf of the Lafayette Township Fire Protection District, a sincere Thank You to the Floyd Memorial Foundation for funding this opportunity to give back to the community and make the community safer for the kids.